A full service building supply store, such as Lowe’s, Home Depot, or a locally-owned independent, can supply virtually every material item that will be used in the construction of your house. On the saving money page, I talk about the need to get multiple bids on your material “take off”. What I normally do is to find the least expensive supplier for all of the items that get me to the point of having a framed house with a roof on it, and stay with that supplier to that point. That includes all lumber for framing, windows, and exterior doors ─ a house that’s ready for shingles and rough-ins of plumbing, electrical, heat & air, etc. After that point, you should consider all available options for suppliers of shingles, wallboard, brick, light and plumbing fixtures, trim material, etc. 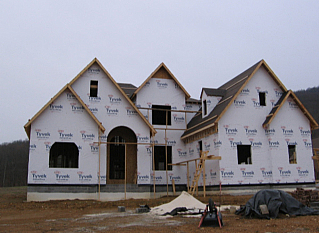 The supplier you used for framing materials will not necessarily be the lowest-cost provider for additional materials. Shopping around for other suppliers will take more of your time, but it should be worth the effort. Savings of several thousand dollars could be the result. You don’t have to wait until just before you’ll be needing the material. Price comparison shopping can be done anytime. In fact, it’s a good idea to do as much of it as you can in the pre-construction phase.